I feel like anytime I tell someone I have a blog, I need to immediately make out like the only reason I do it is because I could make money from it.Or I feel like I need to justify my time spent blogging is all for some future time when I’m going to make all this money because of it, so I need to “put in the work now”. Cause if you don’t make money blogging, what are you doing it for? Why would you spend all that time writing and engaging on social media outlets if you aren’t making anything from it? Would you dare do all of that just for the pleasure and connection it brings? I would! I would care to read about her life. And yours. Maybe cause I’m a psych major and have an overactive interest in how other people live their lives. Or maybe cause it’s just human nature to want to connect. I didn’t start my blog until I became a stay at home mom. I was alone all day without much adult interaction. No coworkers to chat with. There was only so many times I could call my mom or husband at their jobs and try to squeeze out a ten minute conversation with them before they had to get back to the real world. Blogging was a way for me to connect with other stay at home moms, because I didn’t know many in my personal life. My blog was “the office” for me, where I got to chat with coworkers and share similar experiences that only we would understand because we have the same job. It was also a place for me to be creative and do something that was just for me. 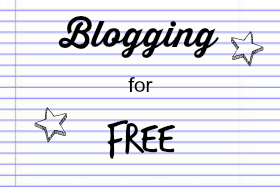 The truth is, when it comes to blogging – I do it for free and I like it. When I think about trying to do it for money, I don’t usually like it. Does that make me lame? I just like to write. I do my blog hop because I meet so many interesting bloggers every week and love going through all the posts that are shared. It’s fun. It’s all fun. And I thoroughly enjoy going back through my blog and reading everything I’ve written over the past few years. I’m not against making money or getting free stuff out of blogging, those are always awesome perks. I just don’t want to go out of my way to get them. I don’t want to write certain kinds of posts that I wouldn’t normally write otherwise, you know? I want to write what I actually feel like writing, and if that makes me money or brings me an opportunity, great! If not, that’s okay, cause I wrote it for myself anyway. I just love this little space that’s all mine. How do you feel about this subject? Why do you blog?